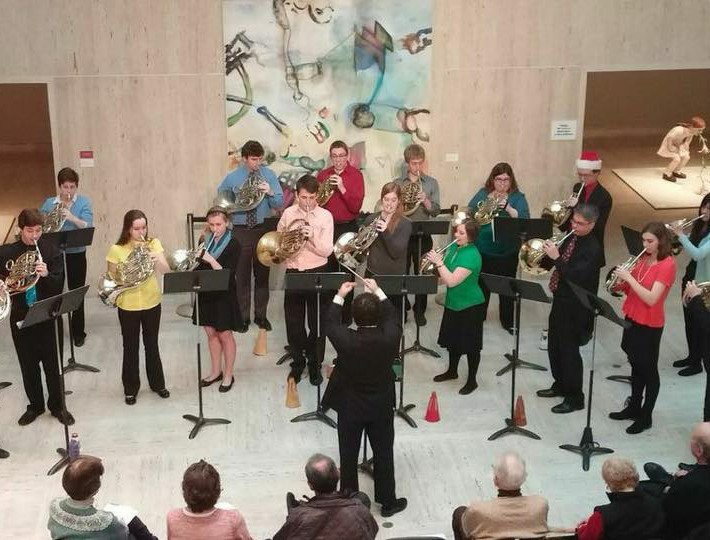 UW’s Horn Choir at a recent concert, at the Chazen Museum. Wunderlin is second from right. Daniel Grabois, conductor. That’s because he’s 50 years old. It’s safe to say that most of the other performers were about the ages of his two kids, 23 and 19. And yes, he is a student. After a full life as a business owner, husband and dad, Wunderlin returned to school this fall for a master’s degree in horn. He first studied the instrument in college (way back when) and played as much as possible over the years. 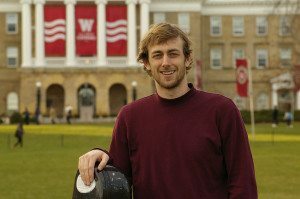 But after he met Dan Grabois, assistant professor of horn at UW-Madison, he finally took the leap and applied for the program at UW. He says he likes Dan’s teaching style. “[Dan] offers a lot of concrete suggestions, as opposed to someone who says, ‘it’s my way or the highway,’ ” Wunderlin says. We asked John to tell us a bit about his unusual career path. What made you want to come back to school for a masters degree? “It was always a long-term goal of mine to come back to school. My undergraduate degree was computer science with a music minor from UW-Platteville. As an undergrad, I made a conscious decision to earn a degree that would allow me to make a good living, but music was always my passion. With a long career in computers and both my children grown, it seemed like the right time to focus on music. What was your previous career, and how did the horn fit in? “I spent 27 years working as a computer programmer. First for several large corporations, then as an independent contractor, and for the last 14 years I ran my own software business with my wife Nancy. After college, I didn’t stop playing the horn. I was always looking for gigs, but did try to balance my rehearsal schedule with my home life- we have two children. In 1999, I came across a summer camp called the Kendall Betts Horn Camp in New Hampshire. This is a camp for horn players of all ages from high school to seniors with world-class horn faculty. It was a week-long opportunity to immerse in music that I have taken advantage of nearly every year since. I credit KBHC with improving my playing significantly to the point that I won my first regional orchestra audition with the Beloit-Janesville Symphony (now called the Rock River Philharmonic). I’ve been a member there for the last six seasons. “I’ve played a lot of gigs in the Madison area and my wife and I both love the town. We lived in Mineral Point for the last 21 years. This was a good opportunity (and a good excuse) to move to Madison. I considered a few other universities, but after working with Dan Grabois and considering my options, it was really an easy choice. What is it like being having student colleagues in their 20s and even late teens? 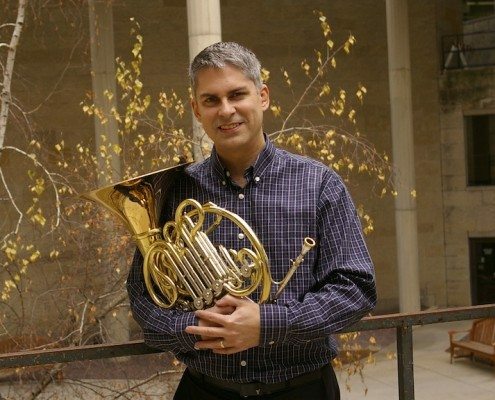 “The other students in the horn studio have been absolutely terrific! From day one they treated me like just another student. I’m amazed at the sense of camaraderie and lack of competitiveness within our studio. I feel like everyone’s goal is to support and help each other become the best musicians we can all be. Have you had any trouble adapting or fitting in? “Very little. 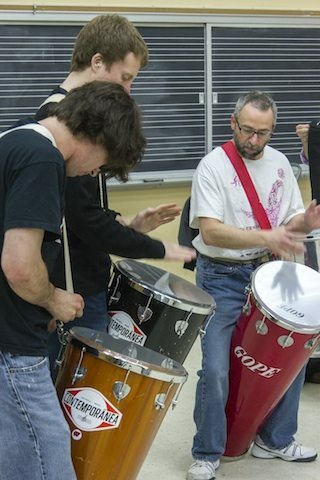 I’m not the only non-traditional student in the music department. There are a range of ages, though I’m probably a bit above the median. 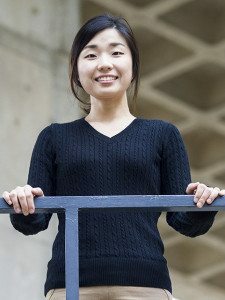 What do you hope to gain from the degree and the experience here at UW? “My primary short-term goal is full musical immersion for the next two years. Beyond that, I’m interested in winning a larger orchestra job and/or teaching at a college or university. Any advice for people thinking of going back to school for a performance degree? 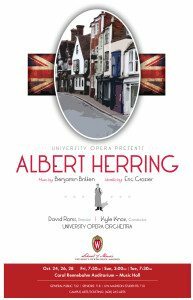 On October 24, 26, and 28, University Opera will present its first operatic production of the season, Albert Herring, composed in 1947 by Benjamin Britten. The libretto is based on Guy de Maupassant’s novella Le Rosier de Madame Husson, and was written by Eric Crozier. It was premiered in 1947 at Glyndebourne Festival Opera in East Sussex, England, and received its first United States premiere at Tanglewood in 1949. It has been called the greatest comic opera of the century. It will mark the first opera staged under the direction of David Ronis, visiting director of opera at UW-Madison. 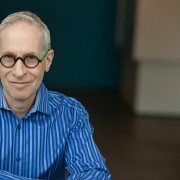 Read about David Ronis’s new ideas for University Opera. The opera will be performed in Music Hall, 925 Bascom Mall, on Friday, October 24 at 7:30 p.m., Sunday, October 26 at 3 p.m., and Tuesday, October 28 at 7:30 p.m.
Loxford, motivated by the formidable Lady Billows, meets in order to select a “chaste and virtuous” Queen of the May. When no young ladies can be found that fit the bill (scandale! ), they decide to choose a King of the May instead. The young man they select is the nerdy Albert Herring. Henpecked by his mother, Albert dreams of going out on his own. For the moment, however, he does not have the emotional wherewithal to break loose from her tether. That changes when his contemporaries, Sid and Nancy, spike his drink during the celebration. Under the influence of alcohol, he conquers his inhibitions and disappears overnight. The next morning, the whole town believes him to be dead. But Albert, of course, reappears and proceeds to tell them all off. Thus, Britten’s opera is both a coming of age story as well as one that gently examines the nature of hypocrisy in modern society. his colleagues when they started the English Opera Group. Some of Britten’s most important work dates from this period in which he wrote for the same forces of 13 instrumentalists and a small group of singers, and consequently made a huge contribution to the genre of the chamber opera. The 13-character cast of Albert Herring features William Ottow and Joshua Sanders in the title role, as well as Jessica Kasinski and Tyana O’Connor as Lady Billows. Additionally, the production will include Alaina Carlson and Jennifer DeMain as Nancy, Brian Schneider as Sid, Joel Rathmann as the Vicar, Tia Cleveland as Mrs. Herring, Sheila Wilhelmi as Florence, Dennis Gotkowski as the Mayor, Emi Chen as Emmie, Emily Weaver as Cis, and Nicole Heinen and Sarah Richardson as Miss Wordsworth. Three local performers join the cast – Rick Henslin as Superintendent of Police Budd, as well as Michael Chiaverini and Eli Kuzma, boys who sing in the Madison Youth Choir, splitting the role of Harry. The instrumental forces for Albert Herring will be the University Opera Orchestra, conducted by Kyle Knox, with musical preparation by Mr. Knox, Chan Mi Jean, and Thomas Kasdorf. The production staff include scenic designer Stephen Hudson-Mairet, costume designers Sydney Krieger and Hyewon Park, lighting designer Jordan Kardasz, prop designer Dana Fralick, scene painting advisor Liz Rathke, technical director Greg Silver, and production stage manager Erin McDermott. Student staff include Emi Chen, costumes; Katie Oliver and Fabian Qamar, props; Melanie Treuhaft, scene painter; Briana Miller, master electrician; and Lukas Heins, assistant carpenter. Tickets are $22.00 for the general public, $18.00 for senior citizens and $10.00 for UW-Madison students, available in advance through the Campus Arts Ticketing office at (608) 265-ARTS and online at http://www.arts.wisc.edu/ (click “box office”). Tickets may also be purchased in person at the Wisconsin Union Theater Box Office Monday-Friday, 11:30 a.m.-5:30 p.m. and Saturdays, 12:00-5:00 p.m. and the Vilas Hall Box Office, Monday-Friday, 11:30 a.m.-5:30 p.m., and after 5:30 p.m. on University Theatre performance evenings. Because shows often sell out, advance purchase is recommended. If unsold tickets remain, they may be purchased at the door beginning one hour before the performance. The Carol Rennebohm Auditorium is located in Music Hall, at the foot of Bascom Hill on Park Street. University Opera is a cultural service of the School of Music at the University of Wisconsin-Madison whose mission is to provide comprehensive operatic training and performance opportunities for our students and operatic programming to the community. For more information, please contact opera@music.wisc.edu. 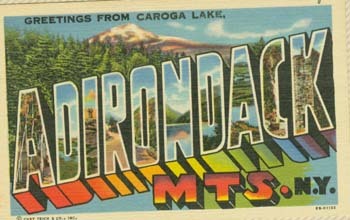 https://www.music.wisc.edu/wp-content/uploads/2014/05/David_Ronis_Luke-DeLalio_ph2014WEB.jpeg 533 800 SOMadmin SOMadmin2014-09-19 17:43:312014-10-13 13:52:21University Opera Presents Britten's "Albert Herring"